Beginning today, Manhattan’s Film Forum has turned the clock back to an earlier time when the American film industry bluffly barreled along during the most fiscally dark period in the medium’s stateside history. Apologies to Crown, but the 50-film compendium “Breadlines & Champagne” has more than its share of seriously mounted yet fun-to-watch entertainments and proves unequivocally that they don’t make ’em under economic adversity like they used to. When the US economy went belly-up in 1929, the movie industry was on the rise. Sound had been a huge gamble and a huge success and the now long ago dismantled practice of individual studios owning or partnering with theater chains helped to keep revenue steady and overhead down. Films were sold to exhibitors in packages. Theater owners had to trust that the full slate of pictures they paid for contained enough bone fide hits to offset any empty seats created by audience resistance to the misfires sure to be included in the “block” of films they were forced to acquire at once. Above-the line-talent was salaried, below-the-line talent was predominantly pre-union, and an assembly-line approach to getting pictures written, shot, and edited stabilized the middle tier of Hollywood studio vertical integration. The 30s arguably proved to be the pivotal decade for each of the major studios. The William Fox Studios and Twentieth Century pictures merged to become 20th Century Fox under former Warner Bros. writer and producer Darryl Zanuck. Universal created the series of iconic monster movies that would remain their branded legacy. Paramount was rescued from the brink of bankruptcy by 1933’s I’m No Angel starring Mae West — a film that would’ve been impossible to make just a few years later once the industry adopted a knee-jerk moralist, aesthetically hamstringing “production code.” Next door to poverty row, Columbia Pictures gained prestige via house Oscar magnet Frank Capra whose pre-Deeds, Doe and Smith foray into agitprop American Madness remains an under seen career highlight. MGM’s L.B. Mayer would consolidate boardroom power so advantageously that he became the first million-dollar salaried executive in American business. 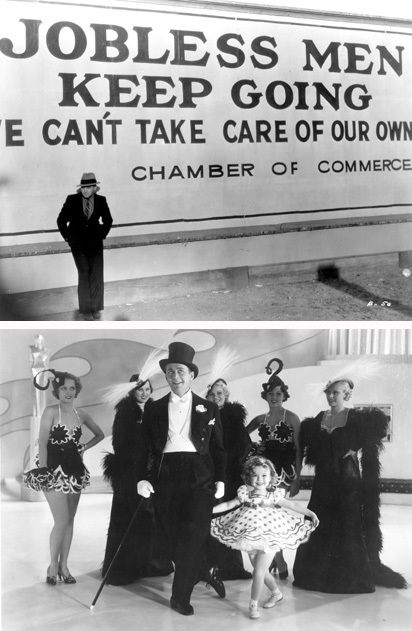 But if there was one studio that reached the peak of resilience and forged a unique aesthetic identity during the Great Depression, it was Warner Bros. Of the 50 films in “Breadlines and Champagne,” nearly half emerged from Jack and Harry Warner’s Burbank fiefdom. Unlike many of their competitors Warner Bros. had no newsreel division. The realities of American life in the Thirties (or an idealized upbeat reflection thereof) were vividly examined in Warners’ gangster pictures like the bracingly bleak Two Seconds, musicals like the iconic 42nd Street and “women’s picture” melodramas like Barbara Stanwyck’s marvelous paean to sleeping one’s way to the top, Baby Face. Interpolated in Film Forum’s series is a five-movie mini-festival celebrating Warners journeyman director Roy Del Ruth, a filmmaker of such reliable efficiency and consistently unostentatious on-screen personality that he could be used as an argument both for and against the auteur theory. Blessed with snappy running times, smart camera work, explicating tight close-ups of key props (shot in most cases by a different department at the studio), Del Ruth’s films bear a certain directorially anonymous perfection that was the secret strength of American film’s studio system heyday. Del Ruth’s films were girded by marvelously expedient, get-to-the-point performances by Warner stable of salaried stars like Jimmy Cagney, Joan Blondell, Loretta Young and Warren William — seasoned stage vets who brought trouper timing to the studio’s high speed production conveyer belt and effortlessly sold Depression-era audiences an image of themselves as plucky, pugnacious and loyal to a fault. In Del Ruth films like Taxi! and Blonde Crazy, Cagney demonstrated particular genius for quick witted, fancy-footed, no nonsense characters. Like most of the heroes and heroines of Breadlines and Champagne, Cagney embodied a long extinct character ideal for whom “yes I can” was a given, not a revelation.